Krishna is a name of the original, unique Supreme Person, the source of all that exists. God has many names, and each describes a different aspect of His personality. Allah, Vishnu, Jehovah, and God refer to His greatness and His role as creator, maintainer of the universe, and Lord of all. The name Krishna—"the all-attractive one"—indicates the unequaled charm and beauty of the Supreme Person, as He appears to His most dear devotees. Krishna appears as other forms of God—avatars—to create and maintain the universe, while He simultaneously enjoys loving relationships with His countless associates in the spiritual world. He visits this material world from time to time to free His devotees from material existence and to vanquish the wicked. He performs superhuman pastimes—lifting mountains, swallowing forest fires, and killing numerous extraordinarily powerful demons—as easily as a child playing with toys. Krishna talks about Himself in the Bhagavad-gita, explaining how anyone can know Him through Krishna consciousness, bhakti-yoga. The Srimad-Bhagavatam further describes Krishna's uncommon and fascinating personality and activities in its Tenth Canto. Krishna is the source of brahman, the all-pervading spiritual energy which includes everything and everyone. We are all one with Krishna, in the sense that we are all parts of the supreme whole. He is also present in every atom, as well as in the hearts of all living things as Paramatma, the Supersoul. But ultimately, Krishna is Bhagavan, the Supreme Person who possesses all opulences—wealth, strength, fame, knowledge, beauty, and detachment—to the fullest degree. Realization of Krishna progresses in three stages; first comes an understanding of His all-pervading brahman feature, then one realizes His presence within one's self and others as Paramatma, and finally one comes to appreciate Krishna as He is, as Bhagavan, the all-attractive Supreme Person, the ultimate cause of all causes, the source of all of us and of being itself. 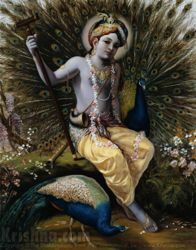 Krishna always appears as a fresh youth with a dark complexion, surrounded by loving devotees, decorated with garlands of flowers and peacock feathers in His curling, bluish-black hair. He plays as a cowherd boy in the rural setting of Vrindavan, along with countless other cowherd boys, gopas, and cowherd girls, gopis. In His pastimes as a small child, He captivates the minds of the residents of Vrindavan with His charming, naughty behavior, such as stealing butter. In His youth, He captures the hearts of the gopis by His irresistible beauty, charm, and flute playing. The greatest personalities of ancient times, such as Narada, Asita, Devala, Vyasadeva—who compiled the Vedas—and Arjuna, to whom Krishna spoke the Bhagavad-gita, all accept Krishna to be the Supreme Person, the Absolute Truth, the ultimate source of all energies, and the One ultimately responsible for the creation, maintenance, and annihilation of everything in the material world. - A multi-volume history of Krishna's many incarnations (avatars), His devotees, and His personal activities. - Krishna's essential guide for how to be happy in this life and the next. - Accounts from a variety of sources describing Krishna's uniquely attractive bodily features. - The culmination of all types of yoga, meditation, and spiritual practice. It is both the goal of life and the means to achieve it. - How to easily access Krishna by chanting His names. - Various ways that Krishna or His avatars have visited this material world throughout history. Bhagavad-gita, 10.12: Arjuna said: "You (Krishna) are the Supreme Personality of Godhead, the ultimate abode, the purest, the Absolute Truth. You are the eternal, transcendental, original person, the unborn, the greatest. All the great sages such as Narada, Asita, Devala and Vyasa confirm this truth about You, and now You Yourself are declaring it to me." Brahma-samhita, 5.1: "Krishna, who is known as Govinda is the Supreme Godhead. He has an eternal blissful spiritual body. He is the origin of all. He has no other origin and He is the prime cause of all causes." Srimad-Bhagavatam, 1.3.28: "All of the above-mentioned incarnations are either plenary portions or portions of the plenary portions of the Lord, but Lord Sri Krishna is the original Personality of Godhead. All of them appear on planets whenever there is a disturbance created by the atheists. The Lord incarnates to protect the theists." Bhagavad-gita As It Is, Introduction - "Of course everyone has a particular relationship with the Lord, and that relationship is evoked by the perfection of devotional service. But in the present status of our life, not only have we forgotten the Supreme Lord, but we have forgotten our eternal relationship with the Lord. Every living being, out of the many, many billions and trillions of living beings, has a particular relationship with the Lord eternally. That is called svarupa. By the process of devotional service, one can revive that svarupa, and that stage is called svarūpa-siddhi—perfection of one's constitutional position." Srimad-Bhagavatam, 7.7.39: ". . . our relationship with Krishna, the Supreme Personality of Godhead, is eternal. Nitya-siddha Krishna-prema. The pure souls are eternally in love with Krishna, and this permanent love, either as a servant, a friend, a parent or a conjugal lover, is not at all difficult to revive." Chaitanya-charitamrita, Madhya-lila 20.108: (Chaitanya Mahaprabhu said:) "It is the living entity’s constitutional position to be an eternal servant of Krishna because he is the marginal energy of Krishna and a manifestation simultaneously one with and different from the Lord, like a molecular particle of sunshine or fire. Krishna has three varieties of energy." Bhagavad-gita, 4.7, Purport: "It is not a fact that the Lord appears only on Indian soil. He can manifest Himself anywhere and everywhere, and whenever He desires to appear. In each and every incarnation, He speaks as much about religion as can be understood by the particular people under their particular circumstances. But the mission is the same—to lead people to God consciousness and obedience to the principles of religion. Sometimes He descends personally, and sometimes He sends His bona fide representative in the form of His son, or servant, or Himself in some disguised form." Bhagavad-gita, 9.11, Purport: "From the other explanations of the previous verses in this chapter, it is clear that the Supreme Personality of Godhead, although appearing like a human being, is not a common man. The Personality of Godhead, who conducts the creation, maintenance and annihilation of the complete cosmic manifestation, cannot be a human being. Yet there are many foolish men who consider Krishna to be merely a powerful man and nothing more. Actually, He is the original Supreme Personality, as is confirmed in the Brahma-samhita (ishvarah paramah Krishna); He is the Supreme Lord." Is Krishna the only God? Is Christ the same as Krishna? What's the difference between Krishna, demigods, and the concept of God in other religions? Who is Supreme, Krishna or Shiva? Is Vishnu the same as Krishna? Will Krishna appear on earth again?